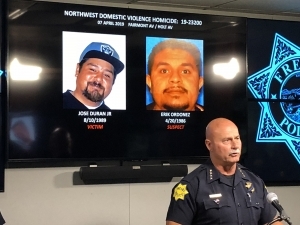 FRESNO, CA (KMJ) – “He was a hero,” said Fresno Police Chief Jerry Dyer of a man shot protecting his sister from domestic violence. The death on April 7, 2019 began as a domestic violence near Shaw and Marks Avenues. 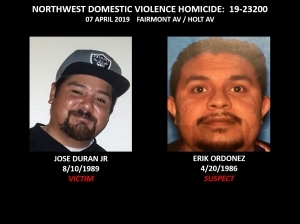 At 10:57 am, that Sunday, Police Chief Jerry Dyer say 33-year-old Eric Ordonez’s wife decided she was going to move out after the couple fought the previous night before the shooting. Her brother, 29-year-old Jose Duran Jr., and her father were at the house at 2694 W. Fairmont. They had brought a U-Haul and were helping her move when Ordonez became enraged and pulled out a gun. When Ordonaz pointed it at his wife, her brother stepped in, taking a bullet in the neck. “He was transported to the hospital and pronounced deceased. He was a hero by all accounts, he died protecting his sister,” said Chief Dyer. Chief Dyer said Ordonez also pointed the weapon at the woman’s father, but it either misfired or jammed. With the help of a California Highway Patrol helicopter, Ordonez was found hiding in a shed several blocks away. He was caught and booked for murder. During Wednesday’s Crime View report, Chief Dyer said they are looking for the weapon from that deadly crime. Dyer said the firearm is believed to be somewhere between the house at 2694 W. Fairmont and the shed a half mile away. “Police through Crime Stoppers are offering a $1000 reward for anyone who turns in that firearm,” said Dyer. Tips can be called in to Crime Stoppers at 559-498-7867. Dyer said they hope the gun will not fall into the hands of a child or a gang member. Chief Dyer said Fresno is seeing most of its crime drop, but Chief Dyer said there were 148 incidents of domestic violence which is driving up the aggravated assault rates by 34% this year compared to the beginning of 2018. The two murders bring the total in 2019 to ten, one more than the total in 2018 at the same time. The other victim, 20-year-old John Sandoval was fatally stabbed at a party on March 24 at an apartment complex on Fruit Avenue near Ashlan Avenue. Police say 19 year-old Danny Duran was drinking at a party with friends when he become sick, others laughed when he vomited. Duran pulled a knife and stabbed four people, killing Sandoval. Neighborhood watch captains in the Marks/Shaw Estates area told the Fresno Police Department that they wanted help. “Our domestic violence unit led by Lt. Todd Lehman and Sgt. Justin Hoagland are going to come on out look for the signs and how to report that and help people that are victims,” sadi Captain Farrah. The meeting takes place Monday, April 15, 2019. Messages left over the weekend or after hours are retrieved during normal working hours. The Fresno Police Department established the Family Justice Center concept to join agencies together at one location with one common goal—to help domestic violence victims. Six detectives and one supervisor staff the unit. The collaborating staff includes two advocates from the Marjaree Mason Center and one case manager from Child Protective Services.